It’s the Ghost wonderful time of the year. 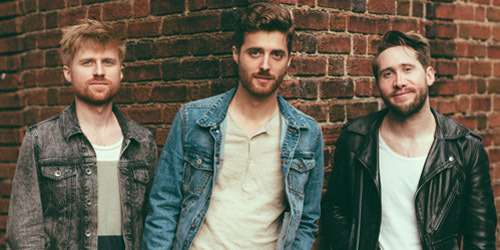 Several newcomers have made it to the top this year and latest to do so is the trio Jukebox The Ghost, who fly 5-1 with a song called “Postcard”. That leap marks the biggest climb into the top spot since September 2012, when “Hall Of Fame” by The Script and will.i.am made a move of 6-1. The Washington, D.C. act has been together for over a decade, but this hit lands them their first single to make my top 40 thanks to a recent album reissue and radio push earlier this month. This week’s Highest Debut is also from a newcomer, ROMANS. You may remember his collaboration with Naughty Boy called “Home”, when he was credited as Sam Romans, though it fell short of my top 40. The singer was born in the English town of Pinner. A handful of top 40 artists were also born there, including Charlie Dore (best known for 1980’s “Pilot Of The Airwaves”) and, most notably, pop superstar Elton John. “Uh Huh” bows in at #36. In January 2006, a teenager from Buffalo, NY made his chart debut with a single called “For You I Will (Confidence)”. The song peaked at #15, and was followed by “These Walls”, which reached #3. However, Teddy Geiger fell off the radar very quickly afterwards. Now, he’s making a comeback as a songwriter, co-writing this week’s #38 entry, “Stitches”, by Vine star and singer Shawn Mendes. It’s his second top 40 hit here. There’s only one act on the chart this week that was also present on my first official chart in September 1999. Back then, he was the featured vocalist on Santana‘s “Smooth”. Now, he debuts with tenth solo hit and his twenty-second overall with a catalog of huge songs with Matchbox Twenty. It’s Rob Thomas and his latest at #39, “Trust You”. His new album, The Great Unknown, will be released later this year. Recent American Idol winner Nick Fradiani has the last of the four entries on the survey with “Beautiful Life”, coming in at #40. He’s a 2008 graduate of the college I once attended, Wheaton College in Norton, MA, though he was gone before I came in that fall as a freshman. It’s still a first for my chart. “Beautiful” is the fifth coronation song by a winner to reach my top 40. A Rae of light at the top. This week’s Highest Debut belongs to the original American Idol Kelly Clarkson and “Invincible”, the second single from her recent chart-topping album, Piece By Piece. It enters up at #33 and follows “Heartbeat Song”, which peaked at #9. If it also hits the top ten on my chart, it’ll be her 17th to do so, far more than any other contestant in the show’s history. We will see just how mighty it is in the coming weeks. Last Sunday night, you may have tuned in for the splashy music video launch of Taylor Swift‘s “Bad Blood” (with cameos from everyone and their mother) at the beginning of the Billboard Music Awards. Now, that track debuts at #35 on the top 40 this week. It’s the fourth charting release from 1989, and all three previous singles reached the top spot. Rolling in at #39 is the ninth chart hit Utah’s Neon Trees, the act led by 31-year-old Tyler Glenn. Their new one is “Songs I Can’t Listen To”, and it’s currently being tossed around the lower rungs of the Alternative chart. To date, the band’s had a #1 with two prior leadoff singles: “Animal” in 2010 and “Sleeping With A Friend” in 2014. Lastly, down at #40, is Rixton and their fourth hit from the album Let The Road, titled “We All Want The Same Thing”. It is released in the U.K. on June 7, a day before their full-length set hits, which came out here in the States in early March. Checking in for a fourth week. 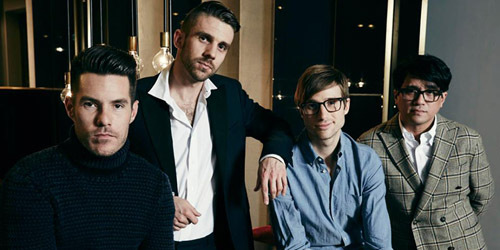 This week’s Highest Debut is the third top 40 song from American Authors, the group that formed in Boston and is now based in New York City. Their single is “Go Big Or Go Home”, new at #35. You’ll be able to purchase it tomorrow. The four men scored a #1 on my chart in November 2013 with “Best Day Of My Life”, which spent a week at the top. Will they march their way their way back “Home” to the top? That story has yet to be written, so stay tuned. As “Sugar” continues to descend on the chart, Maroon 5 rush out a new single with “This Summer’s Gonna Hurt…”, a new entry at #36 this week. It was recently tacked onto the digital editions of V. Should it hit the top ten later this season, it will be the first “summer” title to go that high since Kid Rock‘s “All Summer Long”, which peaked at #8 in September 2008. It should be another huge radio hit for the guys. Last, but certainly not least, the third charting single from Strange Desire rolls in at #39 for 31-year-old singer/songwriter Jack Antonoff and Bleachers. It’s “Like A River Runs”, which is the follow-up to last year’s “Rollercoaster”, a #3 hit. Look for it to officially debut in the Alternative top 40 as well this week. He hits the road with Charli XCX in late July. Mo’ time in the Motel. Formed in The Netherlands in the city of Utrecht, the quartet called Causes (led by English singer Rupert Blackman) land their first top ten on my chart, advancing 12-9 this week with “Teach Me How To Dance With You”. The Dutch band’s hit is the fourth “Dance” cut to reach my top ten since last August, following “Stolen Dance” (#9) for Milky Chance, “Too Cool To Dance” (#6) from Eden XO and “Shut Up And Dance” (#1) by Walk The Moon. That’s a lot of movement there! This week’s Highest Debut is the third Country crossover song to reach my chart in the last few weeks. This tune is the first for the group named Little Big Town, crashing in at #37 with “Girl Crush”. Though the song has faced some controversy since first being issued to Country outlets, it’s now a bonafide sales hit. “Crush” titles have also made my top 40 in the past for Mandy Moore (2001) and David Archuleta (2008). Rolling in at #38 is the week’s other debut, “Photograph” by singer/songwriter Ed Sheeran. This marks the fourth single to come from his latest album, X, which includes a former #1 that’s still gliding down the top 40, “Thinking Out Loud”. The music video for the song was just released and features lots of home videos of a younger Sheeran. Two songs tie for the Biggest Mover this week: Sam Hunt‘s recent #1 on country radio is up six spaces to #27. “Take Your Time” is currently being promoted to CHR and Hot AC radio via Capitol Records, and while the single is currently charting at the latter format, it has yet to debut on the former. Also up six, from 39-33, is “The Book Of Love” from Irish newcomer Gavin James. That title was also a hit on the Hot 100 (#5) for a totally different song by The Monotones in 1958. This week’s Highest Debut marks the fifth chart single for former American Idol contestant Adam Lambert. He comes in at #36 with “Ghost Town”, the leadoff release from his forthcoming third studio album, The Original High, due June 16. It was the second most added song on CHR radio during last week. Lambert’s first entry remains his biggest so far, the chart-topping “Whataya Want From Me”, a two-week #1 from April 2010. They’ve been up and down the chart with their former #1, “Shut Up And Dance”, for 34 weeks now. Of course, the record is a much higher total for the most weeks on my top 40, but Walk The Moon‘s certainly got one of the biggest tracks of this year. Their followup, “Different Colors”, debuts this week at #40. It’s already got the support of SiriusXM’s Alt Nation. They’ve booked a few nights here. In the 1980’s, a California band named The Motels had a string of four top 40 songs, including two top tens: 1982’s “Only The Lonely” and 1983’s “Suddenly Last Summer”. Three decades later, another California band called Saint Motel brings the word back and sings the words on this week’s new #1 song, “My Type”. The track is currently rising towards the top ten on Alternative radio and has some good crossover potential this summer. Up nine notches to #25 is this week’s Biggest Mover, trio Jukebox The Ghost’s “Postcard”. It’s their first top 40 release and can be found on their self-titled album. Though the volume of postcards sent through the mail has decreased over time thanks to email and social media, you can still buy packs of them for use. I’m sure the three guys would appreciate some. This week’s Highest Debut is from newcomer Gavin James, a 23-year-old from Dublin, Ireland who comes in at #39 with “The Book Of Love”. The song was originally recorded by Boston band The Magnetic Fields in 1999, and many covers of it have been issued throughout the years. James’s version is currently a hit in Belgium and The Netherlands. Also debuting this week is another new act, Jakubi, a five-piece Australian group based in Melbourne. They’re new at #40 with “Couch Potato”. In a week, the five men begin a West Coast tour before making stops in the Midwest and Northeast in late May and June. A video clip for the song recently debuted.